Bernie Sanders will run and run and run for president and never give up until Election Day in November because that is what his lifelong hero and moral guiding star, the man he admires more than any other in American history, did. Bernie Sanders will ignore the whining, finger-wagging lectures of Empress Hillary’s eunuchs, Vestal Non-Virgins and other acolytes and take his political crusade directly to the voting booths of America on November 8 because that is what Eugene V. Debs did — five times. 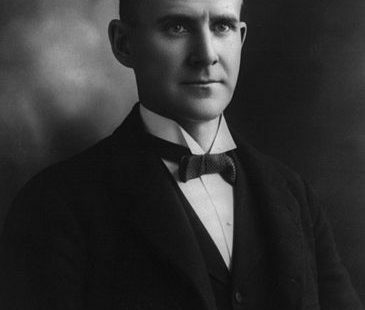 Eugene Debs was the decades-long leader of the Socialist Party in the United States a century ago. He ran for president five times as its candidate. He never got close. However, in his most successful campaign, in 1912, Debs won a million votes, the best showing ever by any socialist candidate in any US national election. He still came in a poor fourth, way behind Woodrow Wilson, Theodore Roosevelt and William Howard Taft. Eugene Debs was never a member of the Democratic Party. Bernie Sanders only joined the Democratic Party in 2015 to open the way for his amazing campaign for the party’s presidential nomination. Woodrow Wilson, the Democrat who won the presidency in 1912, threw Debs into jail shamefully in 1918 for his resistance to conscription during World War I. Debs was in his mid-60s at the time and his health never recovered from the cruel treatment he received. It was a “big, bad” Republican, Warren G. Harding, one of the most underrated presidents in US history, who freed Debs in 1921 so that he could celebrate Christmas as a free man and then underlined the lesson by warmly welcoming him as a guest to the White House. Harding was a good man with a good heart. Wilson, a vicious anti-black racist who re-segregated as much of the US Civil Service as he could, was neither. Yet liberal historians continue to love him. Eugene Debs never bowed down to Woodrow Wilson: he ran against him to the very end in 1912. Bernie Sanders, Debs’ spiritual son – born to Polish Jewish immigrant parents in Brooklyn 15 years after Debs died in 1926 – will never bow down to Hillary Clinton, whatever the consequences, whatever the cost. That truth should be self-evident too.